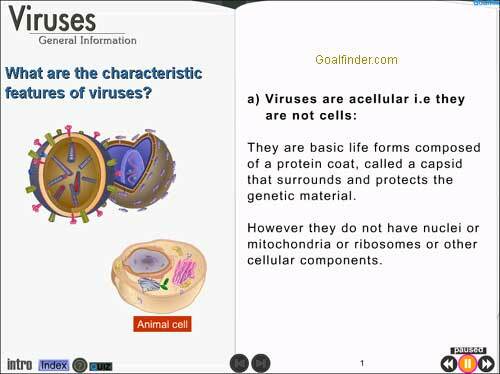 The most in-depth interactive & animated coverage of virus ever, covers- what are viruses?, their structure, genome, capsid, envelope, characteristic features, pathogenic nature, difference between viruses and cellular pathogens, viroids and prions, classification, where are viruses found?, their discovery, studying viral structure, significance of viruses. How is virus structure studied? 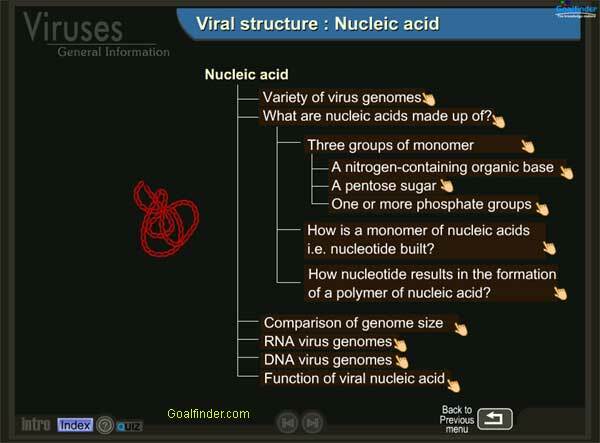 Virus envelope, capsid and nucleic acid are separate animated sections. Capsid animation is a unique one, it shows the assembly of capsid from proteins. 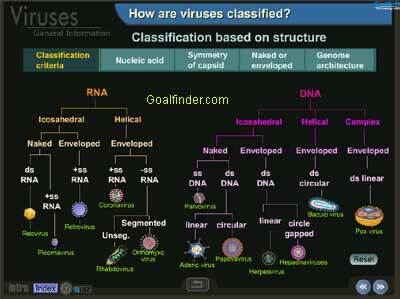 Characteristics features of virus - Explains both living and non-living characteristics of a virus. Viral genome or Nucleic acid - Covers DNA, RNA, wider range of genomic variety. This 2-hour animation is an in-depth and comprehensive approach towards virus. Virology itself is a big topic- this is the part 1 of the triology, the other two parts Virus- lifecycle ( Replication ) and Viral - immunity are presently under development and will be released shortly. Viruses are microscopic entities capable of infecting virtually all life forms. Can be viewed only through electron microscope. Their size ranges from 20nm -300nm. -Nucleic acid packed in protein coat capsid. -Capsid may be surrounded by a bilipid envelope. Capsid- made up of proteins. Smallest subunit - a protein molecule or polypeptide chain. Assembly- protomer - one or more proteins. Morphological or symmetrical unit - Capsomer - one or more protomers. --Embedded in the lipid layer. 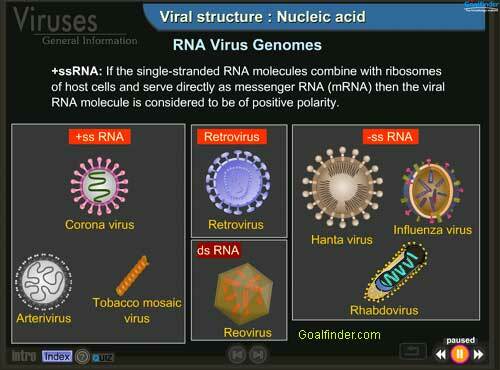 Characteristic features of viruses - Virus possesses both living and non-living characteristics. - Obligate intracellular parasites i.e. replicate or reproduce only within a living cell. All viruses are pathogens to some or the other living organism. - But all viruses bounce into action when come in contact with a specific living cell, take over the cellular machinery and directs the cell to produce virus progeny leading to cell lysis or malfunctioning of the cell, thus causing disease in infected organisms. A few viruses stimulate cells to grow uncontrollably and produce cancers. Not viruses, but virus like particles: Viroids are ultramicroscopic, single-stranded molecules of RNA without any protein coat. They infect plants. -Evolved to infect all organisms from humans to bacteria. In 1880 Mayer identified an infectious agent in tobacco leaves that could transmit the infections into a healthy new plant. In 1892 a Russian scientist Dimitri Ivanofsky discovered that the infectious agent of tobacco leaves was filterable claiming that agents are smaller than bacteria. 1898, Beijerinck referred to this new disease agent as a contagious living liquid-contagium vivum fluid. In 1935 Wendell Stanley crystallized tobacco mosaic virus to demonstrate that viruses had regular shapes, and in 1939 tobacco mosaic virus was first visualized using the electron microscope. 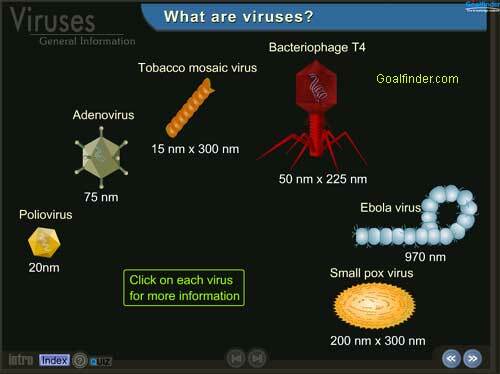 Viruses are simple biological entities and are therefore important to the study of molecular and cellular biology. - Study of viruses helped our understanding of the basic mechanisms of molecular genetics. - Viruses are used as a tool to cure bacterial infections and are now used in curing genetic disorders. - Used in producing vaccines against viral diseases. Ans: An icosahedron follows rotational symmetry of the solid, An icosahedron has 20 equilateral triangles arranged around the face of a sphere. It is defined by having 2, 3 and 5 fold axis of symmetry, an axis of two-fold rotational symmetry through the center of each edge, an axis of three-fold rotational symmetry through the center of each face, an axis of five-fold rotational symmetry through the center of each vertex. The simplest icosahedral capsids are built up by using 3 identical subunits to form each triangular face, thereby requiring 60 identical subunits to form a complete capsid, Viruses generally fit 60 x N subunits into their capsids. N is sometimes called the triangulation number and values of 1,3,4,7,9,12 and more are permitted. All faces of the icosahedron are identical. Ans: Gene flow—also called migration—is any movement of genes from one population to another. Gene flow includes lots of different kinds of events, such as pollen being blown to a new destination or people moving to new cities or countries. If genes are carried to a population where those genes previously did not exist, gene flow can be a very important source of genetic variation. Gene flow can occur between species, either through hybridization or gene transfer from bacteria or virus to new hosts. Viruses can transfer genes between species. Ans: We are sorry but the site is a paid one but the pricing for online viewing is very Rs. 80 for 1 hour, please use this facility for viewing animation online. Ans: We are aware of the following methods of classification of viruses: Nature of viral genome: RNA or DNA, Structure of genome : double or single stranded, linear or circular, Capsid symmetry: icosahedral, helical or complex, Presence or absence of envelope, Replication strategies. Ans: In cancer treatment, healthy cells are also damaged with cancerous ones. Modified adenovirus hTERT-Ad, selectively kill cancerous cells, as they can replicate only in cells containing telomerase (an enzyme found in tumors but absent in normal cells). They initiate autophagy (self-cannibalization- where nucleus is undamaged but organelles are) among the cancer cells. The virus kills tumor cells by forcing them to consume themselves. This treatment reduces tumor size and increases longevity. 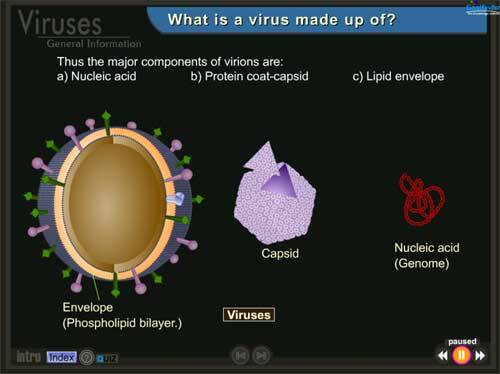 Ans: we have developed a small flash based animation on pox virus that shows structural details of the virus. Ans: Two classifications methods present today, International Committee on Taxonomy of Viruses classification. It is similar to cellular organisms i.e. Order, Family, subfamily, Genus, Species. Baltimore classification places them into 7 groups based on combination of DNA or RNA, single-stranded or double-stranded, and method of replication. Complexities come in by mimivirus ( having 1,200 genes are too complex to be classified), presence of millions of unexplored viral Species in our oceans. Ans: Viruses consist of a protein coat with genetic material RNA or DNA enclosed in it. They can infect all living organisms from bacteria to animals. Viriods are circular pieces of RNA that are infectious and infectious to plants. They do not contain protein coat. Prions are made up of protein molecules. They do not have any genetic material. A single mutated cellular protein PrP, on the surface of certain animal cells, can then transform the normal PrP’s into prions causing diseases in animals.